Today, we'll continue our interview with Kathryn "Katie" Cushman. Check out the details for the giveaway of her book, "A Promise to Remember," at the end of this post. 4) Your handling of grief in, "A Promise to Remember," was right on target. Did you draw from personal experience or indepth research? I'd never really experienced grief in an up close and personal way until a couple of months ago when my father passed away, so it wasn't personal experience. I don't really "study" emotions either. I know a lot of authors use psychological profiles and charts, but those kinds of things just don't work for me. It was mostly closing my eyes and imagining myself in the character's situation. How would I feel? This usually left me teary and emotional, and that's when I knew it was time to write the scene. I would also picture the people I know who are like my characters, and imagine how they would react. I'd spend some time trying to figure out what would make them react that way. 5) What advice would you give writers trying to break into Women's Fiction? First of all, absolutely be on your knees in prayer, asking God to show you His direction--whether that means writing or not. After that, write, write, write. Read books on writing, attend writers conferences (Mount Hermon and ACFW are my personal favorites). Get in a critique group--I met my two main critique partners at Mount Hermon several years ago when we were all fairly new at writing. We don't write the same genre (in fact, they're both men), but we are all serious about writing and improving our craft. Shawn Grady has since published several books, ad Michael Berrier has landed a terrific agent and is on the brink of breaking in. BE PATIENT! A lot of breaking into publishing involves getting the right manuscript in front of the right editor when he/she is in the right mood. We can't control that (especially the editor's mood part). If God has called you to write, then He will work out the details in His time. 6) What new books do you have out or soon to be launched? Angel Song was released in August. This is a book I co-wrote with Sheila Walsh of Women of Faith. It is about a woman's journey through the loss of her sister, accompanied by mysterious happenings that may or may not be angels at work. Another Dawn will release in February 2011. It is the story of a young woman who chose not to vaccinate her son due to fear of autism. When he causes a measles outbreak, which involves several infants and life-threatening complications, she must come to terms with her decision. Note from Susan: My apologies. Blogger won't let me upload pictures of these bookcovers. 1) Only residents of the U.S. are eligible for the contest. The contest is void where prohibited. Sorry. 2) To enter the contest, please leave a comment along with your email address. No email = no entry. 3) For an extra entry, tell me if you're a Follower or become a Follower of Christian Writer/Reader Connection. Maximum number of entries for this contest: four (two on this post and two on last Wednesday's post). 4) Deadline: Saturday, November 20, 2010, at midnight. 5) The winner will be chosen by random drawing and notified via email on Sunday, November 21, 2010. An announcement will be made on the blog on Sunday. 6) Disclaimer: Neither the publisher nor the author provided the book or requested a review/interview. I'm giving away my personal copy. Question for you: How do you handle emotional scenes if you don't have firsthand experience? OH, I'd love to read this book--it sounds lovely. I appreciate Kathryn's advice about timing and prayer. Thank you both for a great interview! Wow! Another Dawn sounds like an intense story. Thanks so much for part II! I enjoyed reading about your journey, Katie. Thanks for stopping by and leaving your email. I'll get in touch with you soon. A Promise to Remember was my first experience with Katie's books. You can be sure it won't be my last. She's an excellent writer. Thanks for entering the giveaway. Wow, how do I handle emotional scenes without firsthand experience? I think through prayer and trying to just allow the Lord to move through me. We have such deep emotions that we try to bottle up and show no one, but it's through those very emotions that others see Christ thorugh us. They see His tender mercy and forgiving love. I would love a chance to win a copy. This book sounds lovely and I love Ms. Cushman's work. I would also love to do a review. Sounds powerful! !Thanks for connecting me to your blog. I love it!! Thanks for being a Follower and commenting. I'm always happy to get feedback. Katie's grasp of how grief affects people in different ways amazed me. She nailed it. 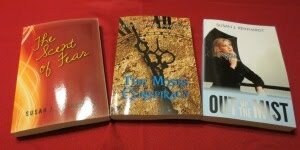 Boost Your Visibility & Your Bucks With Anthologies! Are you growing in the right direction? 1. Sign up to receive my occasional e-newsletter. 2. Sign up to receive my blog posts by email. 3. Enter a giveaway I host on my site, on social media, or at an event and give your permission to also receive my newsletters and/or blog posts. I never sell your information or share it with anyone. If you provide a physical mailing address in order to receive a giveaway prize, I do not store that information after the prize is mailed. You have a right to unsubscribe or to ask to have your information deleted at any time.